As children begin to discover the astounding world that God created, they at the same time begin to uncover the mysteries of science. Rather than being at odds, these two discoveries issue from one and the same Source. This Catholic science text presents to the child both Creation and Creator, in a context familiar to the child: the family. Activities that follow lessons reinforce and bring topics to life in little hands and minds. Through these lessons, children learn the scientific method of observing, comparing, grouping, and measuring change. 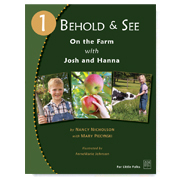 Behold and See 1 users need no additional workbooks, teacher’s manuals, or answer keys; all lessons, activities, and explanations are found within the worktext. 188 pgs. Full color. Spiral binding for ease of use. 8½"x11"
Recommended core text in CHC Lesson Plans for First Grade. Tour this title within the First Grade Interactive Guide!